SolarWinds Network Configuration Manager - Symtrex Inc.
Is it your favorite way to spend your time? No way! Is it necessary? Absolutely! Backing-up, changing and tracking your network configuration can be painstaking, time consuming, and error prone without the right software at your side. 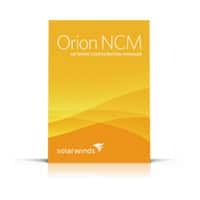 Orion Network Configuration Manager (NCM) delivers affordable, easy-to-use network configuration management that can be used standalone or integrated with Orion Network Performance Monitor (NPM) to provide an enterprise-wide, unified, intuitive view into your network configuration health and performance. You’re going to love having a complete solution that accelerates network configuration and troubleshooting and ensures a stable, high-performing network—no matter how large or small. With Orion NCM, you can quickly fix issues without having to manually Telnet or SSH into devices to change network configuration parameters. Orion NCM also makes it easy to generate and analyze network compliance reports to confirm that your devices are meeting regulatory and corporate standards.